Email received from a mum, after being The Spellwright for 2018 Ludlow Medieval Christmas Fayre. I spoke to the staff and they were telling me how much they enjoyed having you in their classes. The poems were great. They are going to display them. And we were wondering if you could do some training for our staff? Thank you so much for enduring two very hot days in school last week. The Heritage Festival was a great day and we had lots of fantastic feedback about the quality of the children’s poetry writing. I know that the class teachers involved will be in touch to send you copies of final pieces. I do hope that we are able to work with you again in the future and we will be certainly interested in being involved with the Cinderloo project. 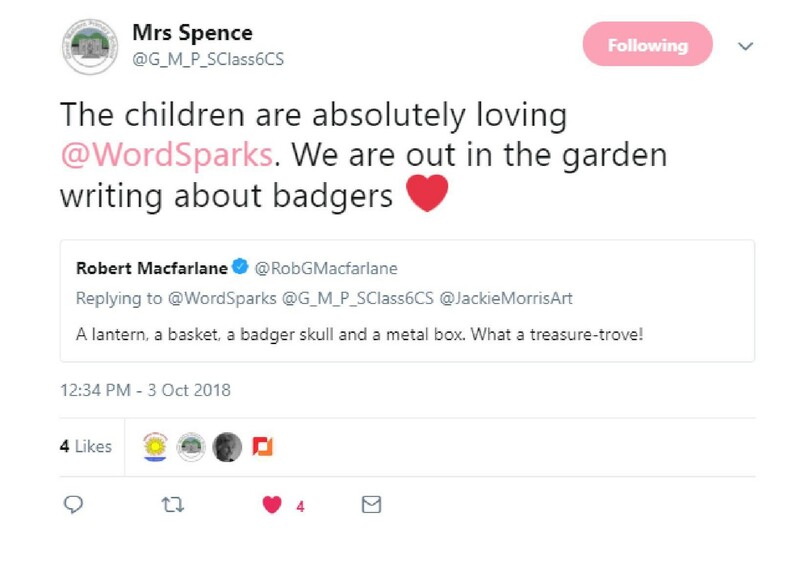 Was just lovely to see it [the Spellwrighting] capture their imagination, so many toys undisturbed in their baskets at home, and your words on parchment created something they found really special, that’s a lovely thing that you are able to do. Thank you so very much for a wonderful Spellwright weekend. You were magnificent and added a truly magical touch to the proceedings. Can I book you again for next year? Give those hard working snails a kiss on both cheeks from me, they deserve a lettuce leaf at the very least! Thanks again Jean, it was fantastic to see the museum buzzing. Thank you for a splendid morning yesterday, everyone thoroughly enjoyed it. Irene expressed how pleased she attended because poetry has not really interested her over the years – she was surprised how much she enjoyed it… especially how the ‘men told their stories’!! Look forward to seeing you next time. Jean’s professionalism, enthusiasm and creative vision undoubtedly made for a successful project. The level of attendance and engagement was much higher than I expected. In managing the project, Jean proved ‘capable hands’, taking the lead on planning, promotion, coordination and end of project evaluation. During creative writing sessions Jean had a real flair with children and adults alike. Impressions of the Past gave all those involved some wonderful, shared memories, not to mention a deeper appreciation of our local heritage. Such a wonderful project! Tweets in response to our ‘Impressions of the Past’ project, March 2017. Jean has a fantastic track record working with schools and the wider community. She uses poetry not only to unlock creativity but as a way of developing essential life skills including communication, enthusiasm and expression. Projects like this are what the Community Development Fund were set up for, so we were delighted to have supported it. Just to say what a pleasure it was to come out and hear the poems read ‘live’ and to the trees. I found it an uplifting and emotional experience, so far removed from the negativity of the mass media! Such a special project. I was delighted to be able to share Brineddin Wood with the Working Together Group and meeting and working with the young people helped to blow away some myths for me too. I hope our paths cross again in the future! From what I saw in the woods the other day, it was a really lovely and worthwhile project – so thank YOU very much. ‘Useful in so many ways – fresh new ideas, good solid practical advice and a great demonstration of supportive, clear facilitation’. ‘Impeccably managed, well-thought out, inclusive, interesting and creative’. Ollie: I liked it, it was fun! I never knew I could write a poem and put pictures into it until I met Jean. Aaron: It was fun because we got to go into groups and choose expressions to fit the word in the middle, then we got to put all the words together to make one of the verses in a big poem. It was the first time I’ve ever done anything like that. Finnigan: It was interesting and clever because Jean asked random questions and then we made up a poem about the questions. Harry: It was good because I’ve never met a poet before. It was fun when we had to tell each other the answers to the questions. Ms Rawles, Literacy Coordinator: Jean’s workshops were so well-constructed and delivered that every student was able to produce an authentic, personal and high quality poem whilst also having a lot of fun. She combined just the right amount of rigour, humour and energy to enable students to turn their initial ideas into something more crafted and considered; we were delighted with what they produced. More importantly, the students definitely got a buzz from creating their own little bit of poetry magic. Thank you also for your work as reader-in-residence at Southwater, it felt to me like a very positive and worthwhile residency. I loved the Readers’ Afternoon and the way you were able to create a presence in the library at the various reader events. 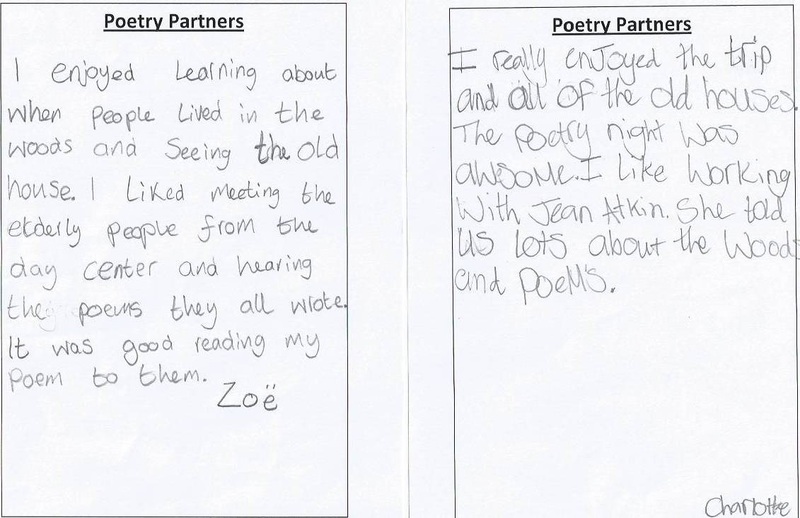 Feedback from recent poetry workshops in Acton Scott, Whitchurch and Shrewsbury. “Thank you Jean for all your enthusiasm, time and thoughtfulness during your time at Logan Botanic Garden. Both staff and visitors alike seemed to get a huge amount out of your programme, which was beautifully planned and delivered. “Poetry Partners was an excellent project bringing together the young and older generations to celebrate their local woodlands. The project was designed and professionally run by Jean with great energy and enthusiasm, motivating participants and bringing out the best in them. The project achieved a memorable celebration evening and an absorbing, well presented booklet of poems, as well as the promise of long-lasting links between local community groups and schools. I believe I benefited from the creative writing workshop as I am now not as daunted as I was about writing poetry. It was beneficial to have our poetry commented on by a proper poet as we then received helpful advice and feedback.